Councillors have thrown out plans for a hard runway at Redhill Aerodrome because it would “scar” the landscape. The aerodrome currently only has grass runways, so cannot operate in bad weather. But the aerodrome’s owners, RAV, say they will appeal to the Planning Inspectorate. Both Tandridge and Reigate & Banstead councils decisively rejected the plans to build a 1,349m-long concrete runway . A planning officer’s report had recommended councillors reject the scheme on the grounds of inappropriate development in the green belt. The new runway would have enabled the air field to increase air traffic movements by about 72% by flying in wet weather. The applicant had “dismally failed” to argue a case of special circumstances in order to gain approval to develop green belt. Opponents said 90% of households were against the hard surfaced runway, and a local councillor agreed with many residents in saying that there was “no merit” to the application which would “spoil the rural area” if given approval. 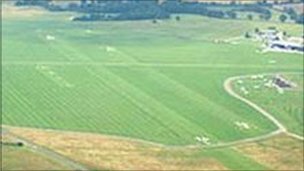 COUNCILLORS have thrown out plans for a hard runway at Redhill Aerodrome because it would “scar” the landscape. But the owners of the airfield, in Kings Mill Lane, South Nutfield, have vowed to fight the Tandridge District Council (TDC) planning committee decision and appeal to the Planning Inspectorate. More than 60 people packed into the council offices in Oxted last Thursday evening (May 30) and erupted into applause when committee members voted to refuse the application to replace the aerodrome’s grass runways with a 1,349m-long concrete surface. A planning officer’s report had recommended councillors reject the scheme on the grounds of inappropriate development in the green belt. Objector Paul Murray said the application had “dismally failed” to argue a case of special circumstances in order to gain approval to develop green belt land, which is usually ruled out by planning policy. Aerodrome bosses argued that the hard runway would boost the number of flights to around double the current 41,000 a year, because they would be able to use the all-weather strip all year round. Mr Murray said that would mean more noise and more traffic, adding: “The development would result in air traffic movements increasing by 72%. And Nutfield Parish Council’s David Chapman said there was “no merit” to the application which would “spoil the rural area” if given approval. Councillors raised concerns about the impact a larger, busier aerodrome would have on surrounding roads and local residents. They said they were also unhappy with the damage it would do to the green belt. Councillor Patrick Cannon said a hard runway would be a “scar on the landscape”, while Cllr Tony Elias added: “Whichever way one looks at this, the concreting of 34,000sq-m and installing lighting poles goes against [council] policies. Cllr Jane Ingham said: “The surrounding roads are totally inadequate to support any further development. But Cllr Ken Harwood said he had “grave doubts” over the committee’s reasons for refusing the application and said he was concerned they would not hold up on appeal. Redhill Aerodrome’s John Horne claimed that the runway plans would not impact on the openness of the green belt site and said planning approval was important in securing existing jobs and creating new roles. A number of committee members raised concerns about future employment at the site if the plans were not successful, but that did not stop them voting against the scheme. Writing online following the decision, Redhill Aerodrome said: “True to form TDC Planning Committee refused permission for paved runway. Next step appeal! The aerodrome straddles the border between Tandridge and Reigate & Banstead, and the plans are set to go before the second council’s planning committee on Wednesday (June 5). Reigate & Banstead officers have also recommended refusal. Plans to build a runway at Redhill Aerodrome have been rejected, two years after the original plans were refused. The aerodrome wanted to replace its three grass runways with a concrete one, giving it potential to increase flights from 60,000 to 85,000 a year. Bosses said the plans would create 140 new jobs and secure the future of the firms at the business park there. Reigate and Banstead councillors refused the application at a meeting on Wednesday. They said the plans constituted “inappropriate” development in the green belt and rejected claims businesses would leave the premises without a hard runway. Jon Horne, chief executive of the aerodrome near Gatwick Airport, said in the first three months of this year, business was down 40% from last year due to wet weather. “You just can’t run businesses viably on that sort of basis,” he said. He said the aerodrome was likely to appeal against the decision. The plans were also rejected by Tandridge District Council last week. Both councils turned down the aerodrome’s original application in 2011, “on green belt and highway grounds”. The aerodrome, which is home to more than 20 companies employing hundreds of people, has been in operation for about 80 years. Last night at Reigate town Hall the Planning Committee of Reigate & Banstead Borough Council voted 17-0 in favour of supporting their Planning Officers recommendation to REFUSE the application to develop Redhill Aerodrome. There were 2 abstentions, 1 being the Chairman which is a matter of proceedure. Former KRAG Chairman Jerome Lynch QC spoke for the opponents in his usual elegant and forceful style. This huge defeat for RAV comes on the heels of the 9-0 defeat they suffered last week at Tandridge. So I make that 26 – 0 to us!! RAV have 6 months to lodge an appeal which we expect them to do. A more complete report will follow shortly …..
KRAG will continue to work closely with other groups involved ( NPC, Nutfield Conservation Society and Salfords & Sidlow Parish Council) and our District Councillors Debbie Vickers, Tony Elias and Dorothy Ross-Tomlyn to defend our Green Belt against this predatory company. Owners of Redhill airfield, RAVL, have submitted a revised application for a hard runway after their first bid failed. They want to replace the 3 grass runways with a one concrete one, giving it potential to increase flights from 60,000 to 85,000 a year and for larger planes. Tandridge and Reigate councils turned down the original bid last year. The airfield think their new application “addressed the reasons for refusal in 2011″. As usual, they exaggerate the number of possible jobs that might be created – alleging it will increase the 450 jobs it supports today to some 590 in future – and attract investment to the area etc. Over 1,000 people opposed the original plans which were rejected last year, realising the plans would create an unacceptable level of noise and pollution, breach green belt restrictions, and destroy the landscape. Posted: Friday, June 7th, 2013. Filed in News about Airports, Recent News.